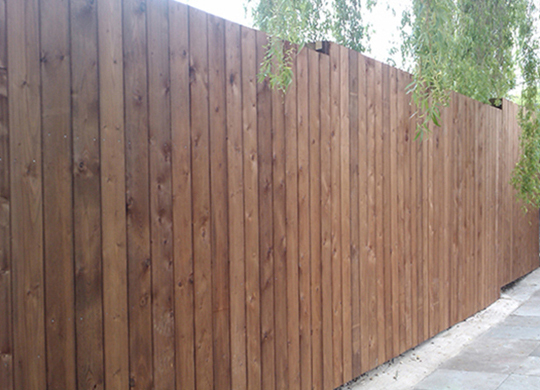 Countrywide Fencing Ltd. installs a wide variety and style of timber fencing to suit your requirements. We source the best quality timber which can be pressure treated or plain prepared ready to paint. As always, we can provide a first class service to meet your timber fencing needs, whether it’s for residential, building sites, motorways, local authorities or schools. We can offer a complete bespoke service to ensure we provide the correct fencing for your requirements. A selection of our range is listed below, however, we can supply and install just about any type of timber fencing you require, so please do contact us to discuss your needs in detail. Close boarded fencing is renowned for its strength and versatility without sacrificing its appearance. It is assembled on site and can be installed to follow the ground level, even when on a gradient, unlike prefabricated panels. Acoustic sound barrier fencing is an invaluable tool in reducing sound pollution created by roads, railways, businesses or public places. It works by reflecting sound waves back towards the source of the noise. We offer a variety of these fences, which benefit from differing sound reduction figures. We can install all of these products to your exact size and height specification, to suit all applications, from domestic garden to a busy industrial estate. Our experts can advise you on the noise reduction system best suited to your needs. Timber knee rail fencing provides an effective low-height barrier. This pressure treated system of posts and rails can offer an attractive, yet extremely effective boundary in car parks, sports pitches and roadsides etc. We supply and install a huge range of nailed and morticed post and rail timber fencing. This sturdy fencing provides a very attractive and versatile boundary with its variety of finishes, from irregular sawn rails which offer a rustic appeal, to sawn square or machine rounded posts and rails. Hit and miss fencing is an ideal solution where screening is needed alongside air circulation. The construction allows air to pass through, making it an ideal choice in high wind level areas or to obscure bin stores where ventilation is also required. Timber sleepers have become an increasingly popular choice in landscaping works. These solid timber beams provide a very sturdy and robust retaining wall. Sleeper walls are easy to install and provide an aesthetically pleasing finish.